LUCKY LOVE Knee High Socks - Your Feet's New Best Friend! On a chilly day, there is nothing like a pair of boots to keep your feet looking stylish and protected from the cold, but if you really want your toes to feel as warm and toasty as possible, you need more than just a basic pair of boots! The LUCKY LOVE Knee High Marled Boot Socks for Women Multi-Pack gives you multiple colors of the best socks to slip into to keep out the cold and treat your feet to something luxurious! With our soft knee socks, you get eight colors of boot socks with a classic marled design. The packs include brown, black, rust, grey, maroon, teal, blue and pink two-tone socks, giving you the perfect pair of duck boot socks to wear with any outfit. You simply can't find socks of this fine quality sold for such an economical price anywhere else! 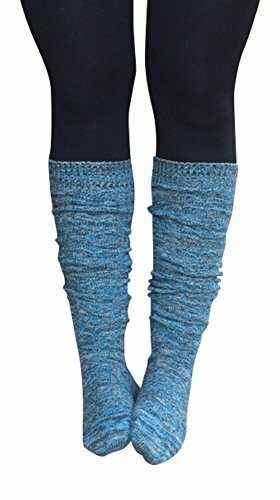 These women's knee high socks are perfectly sized to cover your legs and fit like boot socks cuffs but with the added benefit of closed toes to ensure that you stay warm. They're perfect for wearing with duck boots, booties and knee high boots and sneakers, and you can be certain that they'll remain in fashion year after year. One size fits most - our over the knee socks are one size so nearly all women can enjoy their warmth and stylish look! Pamper your feet and put the perfect timeless finishing touch on your outfits with the best knee high socks on Amazon! KNEE HIGH SOCKS THAT [STAY PUT]: We know what it is like to be pulling at your over the calf sock...trying to cram your fingers in your boot in hopes of grabbing the top of the sock so you don't have to take your boot off completely! That is why we created the Lucky Love extra long boot sock that we promise will stay up all day without being to tight! No impressions left on your legs after a days wear. WARM [BUT NOT TO TOASTY]: We have all been there...wanting to keep our feet warm, so we put on an extra thick sock and then try to shove our foot inside our normal size shoe for an uncomfortable fit. Problem solved...this Lucky Love sock is the perfect combination of warmth without being too thick! LUCKY LOVE [GUARANTEE]: We know that ordering online can be a little challenging sometimes...finding the perfect fit and right color without seeing it in person can leave us a little hesitant. When ordering a Lucky Love product, you have no worries! We will make sure you are taken care with a return and refund or exchange, no questions asked! WHAT OUR [CUSTOMERS ARE SAYING]: "Toe-tally sock-cullent! Comfy. Cute. Cuddly. Couldn't ask for more! Wonderful socks, long enough for someone tall. And very good spandex - they stay up all day without having to tug on them! Definitely happy with this purchase - they're super long, yet you can scrunch them down for shorter boots. They fit larger calves as well! These are the best socks I have ever owned. " PERFECT GIFT OR [STOCKING STUFFER]: If you are looking for the perfect Christmas, birthday or "just because gift" for that hard to buy for wife, mom, daughter or friend, you have landed on it! You are sure to get the right size, as one size fits most, and it comes packaged in our signature Lucky Love bag making it perfect for gift giving. If you have any questions about this product by Lucky Love, contact us by completing and submitting the form below. If you are looking for a specif part number, please include it with your message.